BROWSE ALL HOTELS IN SWITZERALND BY DESTINATION - REGION, CITY OR RESORT! Switzerland Ski Resorts Snow Levels & Skiing Conditions Reports. Swiss Glacier Resorts and Ski Season 2019 / 2020 Holidays. Zermatt - this first class ski resort is the highest in Europe. And the facilities are according too. The cable car Kleine Matterhorn will cheerfully lift you to an altitude of 3200 metres from where you will have a magnificent vista to everything below. It's the stunning landscape that matters most when you climb up to the top of Matterhorn - it is capable of changing your perspective on life altogether. And there is another good news too - you can possibly ski in Italy till noon and then return to Switzerland for the evening. Besides skiing the resort boasts excellent conditions for snowboarding, snowshoeing, hiking, toboggan riding. In addition to the tourist information and travel guide of the Swiss resorts and cities, we at Switzerland-Trips.com are concentrated on providing quality, but cheap hotel accommodation reservations in more than 2000 destinations in the country. We, along with our partners offer over 8000 discounted hotels in Switzerland - from luxury 5 star apartments to small budget and cosy rooms in best Swiss cities and resorts. On our Switzerland hotels dedicated page you will find reviews of some of the best and cheapest hotels in the most popular travel destinations, such as Zutich, Bern, Geneve, Basel, etc, as well as direct links to all destinations, regions and airports available hotel accommodation. Have a nice and comfortable holiday in Switzerland with the secure online hotel reservations of https://www.switzerland-trips.com and our partners! 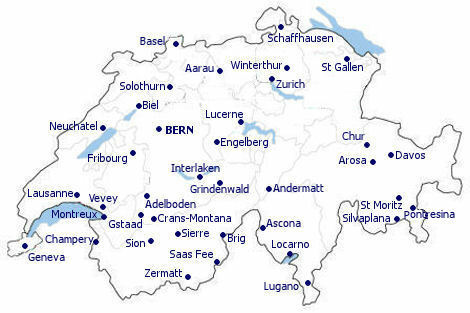 BROWSE ALL HOTELS WE OFFER ACCOMMODATION IN SWITZERALND BY DESTINATION - REGION, CITY OR ANY PARTICULAR RESORT AREA HERE! Lower Grindelwald Glacier is nearby too. It's a natural formation whose magnificent gallery reveals interesting relief and colourful marble patterns. If you are eager to experience something more extreme then you might join a guided climbing of the north side of Eiger. You can find a climbing guide in Bergsteigerzentrum in Grindelwald. It is a great fun to be at the husky dogsled routs in: Alpenzell, Flumserberge, Toggenburg ( all in northern Switzerland ) Bern observatory of Les d Diablererets, Le Noirmont in Franches- Montagues , Les Mosses I Saint Gergue (in the area of Lake Geneva) The Foundation Barry provides dogs of the breed Saint Bernard . It all goes like this: parents lead the dogs on a leash while the kids are enjoying the ride in a sled pulled by the four-legged. For further information just refer to: The Tourist Office:Champex-Lac. Tel:+41 27 775 23 83. 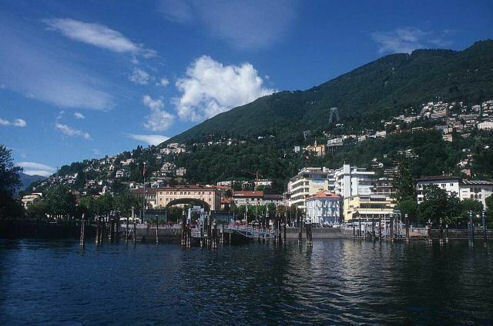 A non-traditional tourist spot is the balneological resort Locarno. The Piazza Grande square, from which you will go to the sights, becomes an open cinema during the international cinema festival during the summer. The World Music Festival and the Jazz Festival gather here another group of fans of the universal culture. Nearby are the medieval Castello Visconti Castle, the Civico Museum of Great Roman Artifacts, open from April to October. A cabin lift can take you to Mount Colmanquio, where you can discover incredible landscapes to the Alps and Lago Maggiore. According to the legend, the Virgin Mary from the rock temple over the city is his patron. Five centuries ago, it appeared many times as an apparition to the monk Bartholomew, and on his suggestion the people on their back carried the materials for the construction of the sanctuary and the many chapels on Via Crucis. The most attractive place here is the Santuario della Madonna del Sasso. There are more than 200 km of hiking trails in the area. Monte Tamaro (1950 m above sea level) and Monte Gambarogno (1710 m) are nearby. Do not miss the Bolle di Magadino nature reserve. For details, see the city's tour desk, which is open from March to October, all day. CERN in Geneva? Why should I visit it? CERN brings together the brightest scientists from around the globe and their only concern is the future. CERN is a laboratory for high technologies in any field possible. They have created a huge “web” serving myriad websites worldwide. 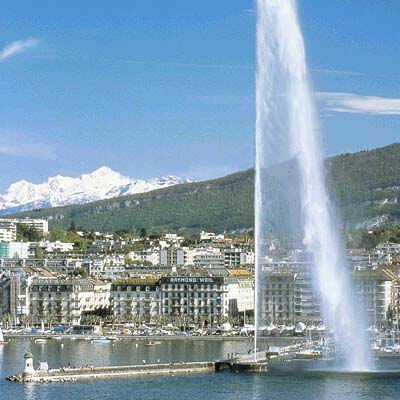 There are a lot of irresistible attractions in Geneva: small jewellery shops, shops for chocolate, wine, fondue, craft chocolate and other regional specialties which can satisfy even the most demanding tourists. Mrians Jazzroom is going to host a good number of world-renowned musicians who are performing in more than 200 concerts. Another stage is going to hold talented American students performers. It is going to be a smashing event. For further information: https://www.startickets.ch. Bern - medieval and hypermodern. Both features seem to be adorable parts of the city's cultural integrity. Its tourists get amazed by the unique architecture, the longest covered shopping promenade, Laubengange, also by its 100 water fountains and springs, by its clock tower. Since 15th century the clock tower has been telling the time, motion of stars and horoscope signs. Another notable must-see attractions are The Parliament, Bear Park, Einstein's house in which he worked and eventually proposed The Theory Of Relativity. As for the holy cathedral Berner Munster it dates back from 14century. And last but not least, the Enzo Piano's Museum Of Contemporary Art where traditionalism and modernism go hand in hand. 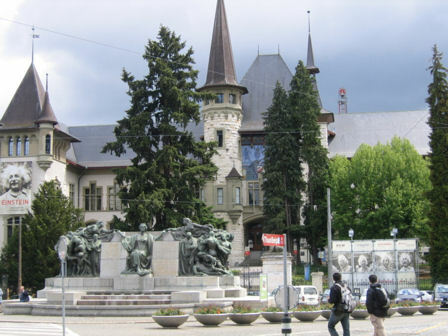 In 1983 Bern was called UNESCO World Heritage Site. It is one of the five cities around the globe offering best food. This cultural gem is just 2 hours away from London by plane, so it can be easily visited during a weekend. Accommodation prices vary a lot so the campsites, hostels, hotels, apartment will sure satisfy every taste and budget. "Stay tuned for Swiss travel, 2019!"